Organic dried garlic. The kitchen would be a poor place indeed without this versatile bulb. Gently fried, it’s the foundation of any soup, stew, stir fry, pasta sauce and so much more. 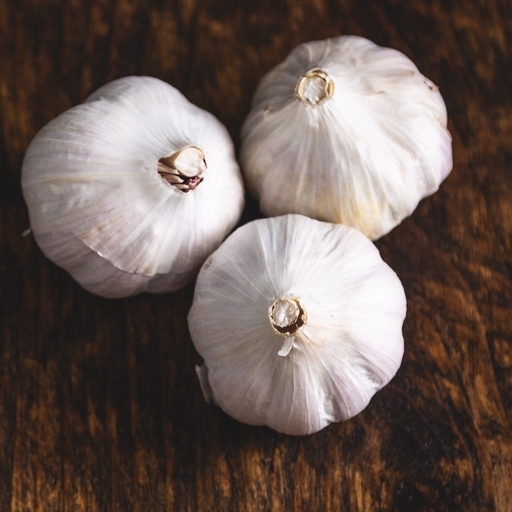 Our garlic is full-flavoured and pungent, but turns so very sweet when you roast it. For a gooey condiment that makes most things taste better, slice the top off a whole bulb (or a whole lot of bulbs), trickle with oil, wrap loosely with foil and bake at 180°C/Gas 4 for an hour. Squeeze out the soft, golden flesh to use in salsas, salad dressings or as a sweet, mellow ketchup for roasted veg, meat or fish. Garlic should be kept in a dry and airy place to delay sprouting and the development of rots. If well dried it should keep for several months even at room temperature though it shows an increasing tendency to sprout as spring approaches.